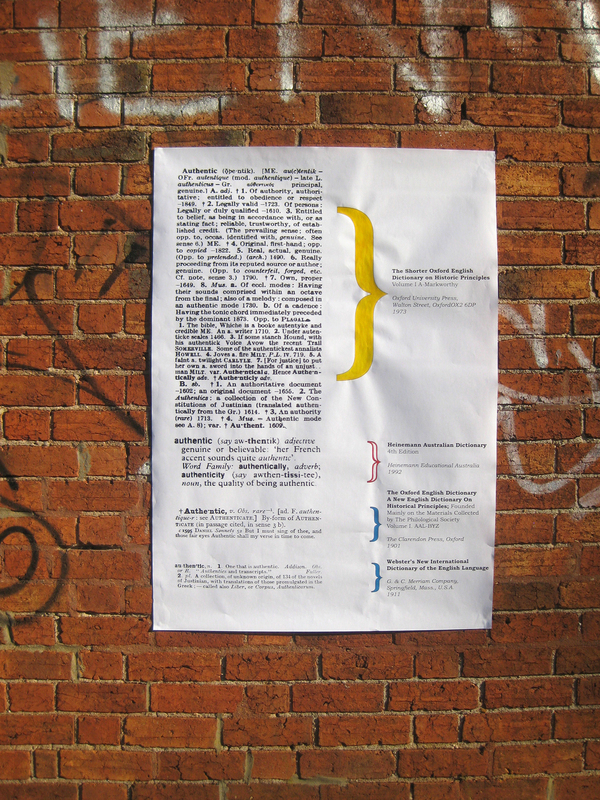 Dictionary Definitions was a work produced in response to a call out by the online journal Critical Contemporary Culture. The works were A0 scaled posters, hand coloured, and were composite images derived from scans of dictionaries. Highlighting a space for contemplation and consideration instead of consumption. We collected and collated archaic, modern and contemporary definitions of words from dictionaries from the UK, Australia and The USA. Choosing: Fake, Authentic and Original as words to research. Each chosen word was compared and contrasted highlighting the differences of history and geography in language. Then brought together in large posters, which were posted around London, Melbourne and New York, as these were hubs of the origin of these differences in language. These posters were then photographed in the streets and these images become the artwork that CCC published. The idea of the artwork was to encourage appreciation for the semiotics and symbology of the language that we employ everyday. We hope to allow for thinking time and space in areas where consumers get bombarded with thousands of images and ideas. Being done with a moderate dosage of satire. The poster has been used both for commercial promotion as well as political activism, and this project aims to highlight both those histories. What the collective aims to do is allow for more questions to be asked through and about this medium of promotion. Its power is through how it engages with the audience and replicating this is essential to the artwork. Elements of playfulness and creativity are balanced with an opportunity for the participant(s) to engage with their own understanding of language and, more specifically, the links between words and their definition. By showing how different institutions like the Oxford English dictionary endeavour to pigeonhole words. We aim to open up the differences and expose the nuances of words of the English language that we use everyday, usually without thinking. This artwork also explores the notion of truth and falsehood. Ideas usually considered inflexible but on reconsideration; are actually extremely malleable due to the history of progression in language and distance created in the nuances of words.